← Brothers Burgers One Day Half Pounder Sale is here again! Making sure that you have a variety of colors in a lunch is one way to make it pleasing. Bright contrasting colors set beside each other is even nicer because it intensifies the colors even more. One bento-style that uses this technique is the sanshoku bento, a three-colored, three-topping bento. To put a bento like this together, evenly layer a bed of rice in a single-tier bento box without dividers. 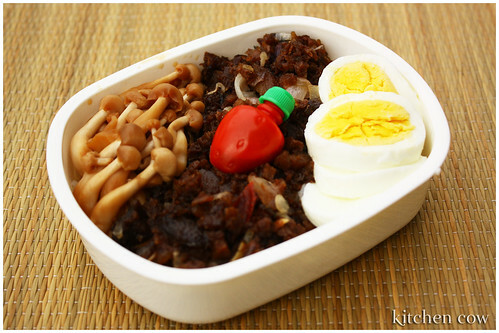 Then, lay a strip of your one of your dishes down the center, in my case, sisig. Afterwards, fill the top and bottom gaps with two other dishes that match your main dish. Simple side dishes, like these soy-simmered shimeji mushrooms and hardboiled eggs are good for layering, though admittedly, the shimeji didn’t really complement the sisig. Culture clash, I guess? As a final touch, I added a strawberry sauce container of soy and calamansi (Philippine Lemon) sauce for the sisig. It’s also best to not put anything too liquidy as it will simply soak through the rice. Also, avoid putting dishes that could ruin the flavor of the dish beside it together. Contrasting flavors that are complementary like savory scrambled eggs and sweet sakura denbu are an excellent topping choice. Colorwise, this particular bento isn’t a good example of sanshoku because of the prevalent browns but I’m the sort of person who cooks what’s available. A solution would’ve been to put the egg in the center instead but I couldn’t because there was too little egg and too much sisig. Still, basic concept is there. Three different toppings, all layered in a stripe pattern over rice. Sanshoku, yes? My apologies for the downtime from Sunday night to Monday afternoon. Was switching servers because the frequent downtime and slow connection speed of the old server was honestly driving me nuts. Hope this new one fares better. In case you left comments or sent me messages through the contact form, please resend them. Thank you for your patience and for sticking with Kitchen Cow. Oh, and tomorrow’s your last chance at winning a Tray Couture Set from Delifrance. Currently at 30-ish entries, I think that the 1:3 to 1:4 chance to win isn’t such a bad thing, so don’t let it pass! This entry was posted in admin, bento. Bookmark the permalink. Lesson learned? Match shimeji with something else! Heehee.